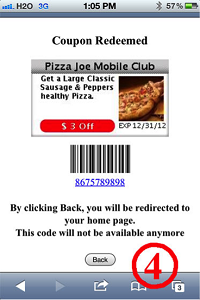 How to Create a Mobile Coupon- In Depth Version – Mobile Marketing Made Easy! 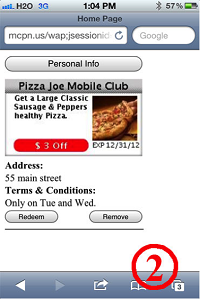 Log in to your advertiser dashboard and under ‘Features’, click ‘Mobile Coupons. You will be taken to the coupon creation wizard. First, you will be asked to choose a coupon type. 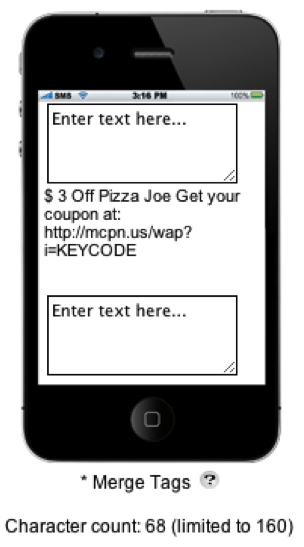 Our template is a quick and easy way to create a visual coupon to be displayed on the mobile device. An image coupon will use an image you upload as the coupon itself with the expiration date and name of the coupon. An SMS coupon is simply a text message containing the coupon information.You may either upload an image that is 93x93 pixels or select a preloaded image from our gallery. You can select which image you would like yo use. Click browse to find your file on your computer. Once you choose your image, the picture should automatically upload and appear on your coupon preview to the right. If you have no image, you can click on "Select From Gallery" to browse our gallery of thumbnail images. From there, pick your discount type: dollar amount off, percentage off, buy x get y, free offer, golden price or rebate. Indicate the value/parameters for the coupon if necessary. You are able to pick the color of the discount. Specify the name of your coupon for your records. This name will only be seen by you. After, you can add a description to help explain to your customers what exactly the coupon is offering. -Click on "Enable Viral Sharing" to enable customers to share the offer with friends via SMS text (The green button) to social media ranging from Twitter (middle) and Facebook (end). - Select the date you would like your offer to begin. Then, select the end date you want the offer to end. You can choose the day, month, and year. Hit the box with the three "..." to open up a calendar if you want to choose an even later date. 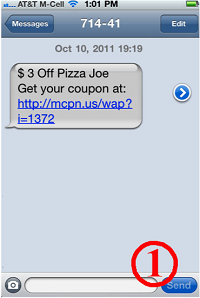 - Click on "Enable SMS Redemption" if you would like to allow your customers to redeem their coupons via text messaging. If you do not choose this options, your customers will receiver a link that they will have to click on to get to their coupon. ---- Notice below this is the coupon preview. These images will change as you add information to the coupon, and the preview can be seen on the right hand side of the coupon builder. Click ‘Next’ when finished with this page and you be directed to the last page in the wizard. This page is an overview of the coupon’s details and allows you to click to one of the previous pages (1.Creation, 2. General) to edit the details. When the coupon is sent to a mobile user’s device, they will see this message and can click on the link provided (1), which will take them to their coupon wallet (2). The coupon wallet is a collection of all the coupons they haven’t yet redeemed that have been sent to them via our short code 71441. These could be coupons from other businesses that happen to use our services as well. Once they redeem the coupon, it is gone from the wallet and therefore cannot be used again unless they are sent the same coupon again. The customer clicks ‘Redeem’ for the coupon they want to use. They will then be asked to supply a branch code if you had checked ‘Branch code required’. 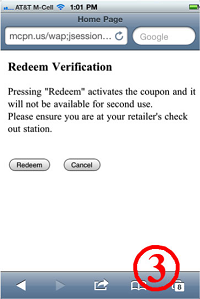 This page will tell them ‘Pressing “Redeem” activates the coupon and it will not be available for second use. Please ensure you are at your retailer’s checkout location’ (3). Once they press ‘Redeem’, they will be taken to a page with the barcode (if you selected ‘Promotion code’ in the barcode drop-down menu, there will be no barcode) and the code number (4). The cashier may either enter the code number into the POS or scan the code directly from the phone. 1. Use as an incentive to customers and clients to opt-in to your businesses list. 2. Send out a coupon to customers to drive business. For example, if Wednesday night is your slowest night at your restaurant, send out coupons to everyone on your opt-in list to help get people to the restaurant. "Hey, come on in tonight for half off appetizers!"